Stretching keeps your muscles flexible and strong. Staying flexible allows joint support and fends of atrophy. Everyday activities can be misleading; from sitting to regularly carrying a bag, one can cause muscle tightness. Neglecting to stretch can cause aches and pains however this quick stretch series will target some of the most common stiff areas. Always breathe your way through stretching! As a runner this strech stands out. 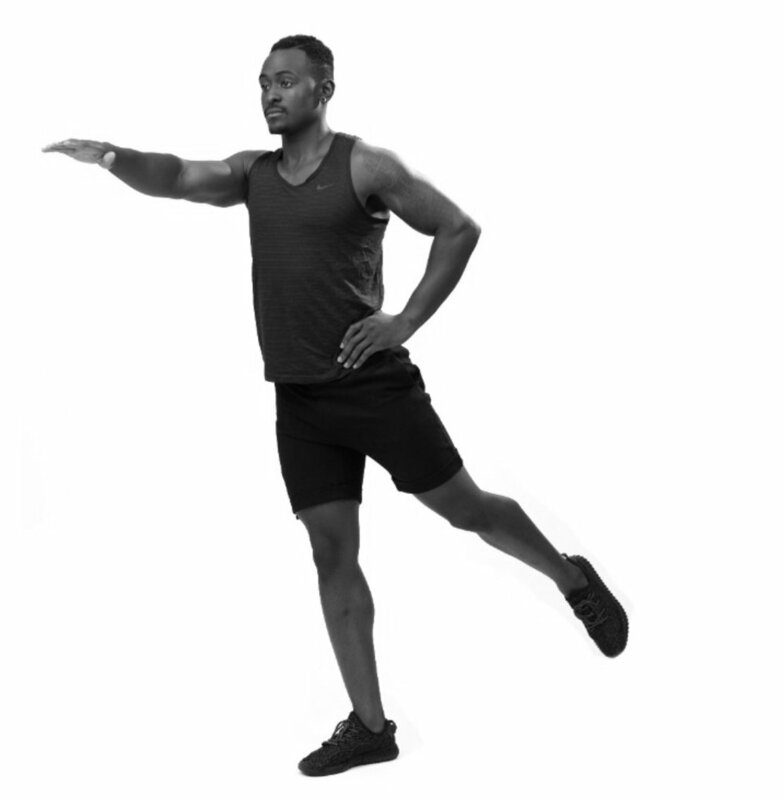 Injury prevention is key and this movement allows for stretching and waking of key leg muscles. Doing this can lengthen and strengthen. Maintain posture lowering and pushing back up slowly maintain form shown. Being able to bend side-to-side comes into play in our work and home lives. Take a moment to center your breathing, standing with feet shoulder width apart and forward, allow your body to comfortably lean to one side and return to center. Every day activities like sitting can be tough on your glutes. If you are sitting for a majority of your day, you could already be starting glute atrophy. If nothing else, take time out of your day to perform this move at your desk, in your office, or as apart of the series. Note: if freestanding is a bit challenging feel free to hold on to a chair. Hip flexors help you sit, stand, run and just about most functional movements. Perform this move by swinging the leg in a controlled manner to warm up and stretch your possibly tight hip flexors. Note: If doing this freestanding is challenging, stablize using a chair. Simple rotational stretches (for your thoracic spine) are ideal in day to day. As we sit in the car, on public transit, at work, we are bearing a load that can cause aches and pains all over the back. Perform this stretch by starting facing forward and controling your movements to each side, as your hips remain forward.